Dirty Berry is a beautiful dusty shade of light Lavender Purple with subtle holo lavender/holo shimmer. This polish has a fantastic, two-coat formula. This is a really popular polish and I understood why the second I put it on. This is BEAUTIFUL!! This is such an unique and beautiful shade. Electric Green is exactly that! A crazy bright, lime green with strong glowing Green shimmer. I don't have anything else like this polish in my collection. This polish has a great Two coat formula. I also love the bottle. It reminds me of old school polish bottles. Gold Fever is a blend of micro Gold glitter accented by slightly larger Red particles. I really loved this combination and the texture of the finished matte mani. Moon Dust is a dense color shifting topper. It's pretty cool, there is a dustiness to it that gives it a cool texture. This polish came from England. A Lovely Secret is a really pretty shade of Lilac Purple with this interesting Purple shimmer/texture and then a micro magenta flash that is barely there. I can't really describe it. I absolutely love this shade and it has a great formula. I used Two coats. Glamorous LIfe is an awesome Berry based shimmer with great Pink flashes. When I wore it I decided to layer it over Zoya's Rehka to light up my Red base. I Want That! is a great, girly shade of Pink with a subtle Pink shimmer in the creamy base. This shade has a great Two coat formula. #147 didn't photograph quite right. This is one of those vivid neon Teal/Green/Blues. You guys know what I'm talking about right? Well anyways, this is a great shade and it has a great formula. It also make great underwear for Floam. Thanks for stopping by for this Sunday Spam. I should have my challenge nails up tomorrow and be back on track by Tuesday. Thank you to Sharon and Joan for sending me these pretties! 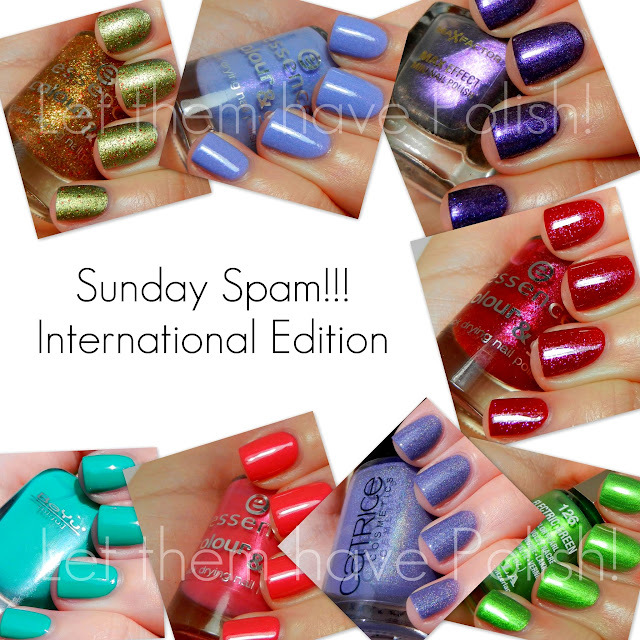 So, your swatches make me think I need to take a trip to England, lol! Stat!! Hi Christina! I love that you swatched the "internationals", finally colours I can easily get! lol. I've done some nail art with Mavala electric green on my blog. Mavala is in fact a swiss brand, and as I'm in switzerland is easy to get! I love me some spam! I can't believe I never noticed how perfect Gold Fever was for Christmas. Now I'm glad I kept it! That Electric green is really catching my attention too... Drool. So many pretties - I lament that I cannot even get the shades of Essence that are sold in the US where I live...and Catrice, I can only hope sometime they will market it in the US! What a lovely post to brighten my Sunday - the sun just broke through after a AM and early afternoon of rain and dark clouds and then your email shined in here too! Thanks! Dirty Berry has got to be my favorite, so pretty! Catrice Dirty Berry is awesome !!! Ooooh I LOVE everything glittery! Drooling!!! I'm glad you like English polishes! I have to say, being from England I find it incredibly frustrating that I can't get my hands on cheap OPI, china glaze, bb couture etc. I mostly have to resort to ebay and they don't always have them on there anyway! They all look great on you :). Blue Nails for World Diabetes Day!